I first heard about the shows in China through Joao Lynce. I have known and trained with him for many years and he contacted me asking if I would like to go to China to ride with him. I love travelling and often do so with working with horses, although never to China. 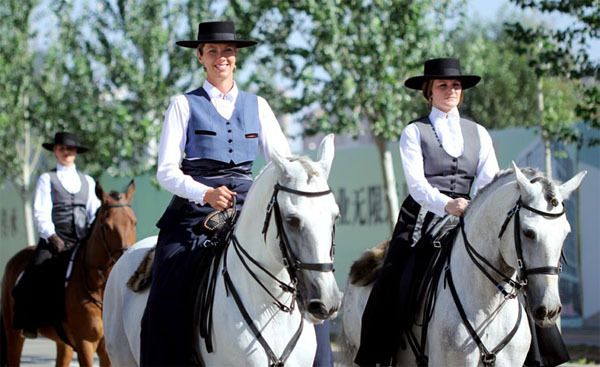 Joao explained about the Lusitano horses being recently imported and the promotion of horse culture through parades and shows. Myself and the other English riders are experienced at international competitions and shows in the UK so this was a great opportunity to bring our experiences to China. I was very excited about the trip, I love working on shows and also curious about China itself. Although I have traveled a lot I have not met many Chinese people who ride. I knew there were some Lusitano horses there but I had no idea of the quality or quantity. I knew Ordos was a new city with few people living there so I was interested to see what it would be like. Friends had been to Beijing so I was expecting it to be more westernized. Baotou and Dalate we didn't know what to expect. We were unsure of how the show would work and how there arenas would be. I didn't think there would be a permanent arena set up so this again was something we discussed before coming to China. But I love being in China, it is nothing like I expected! The cities are amazing. Ordos being a new city was lovely to look around with some beautiful sights. I really enjoyed Ordos city although surprised at how few people were there. Ordos is unique because of the fact that a whole city had been built with not many people there. A city normally grows with the people that inhabit it. It is rare to find a new city with so many beautiful art works and so well cared for that is quite so empty. It was nice to walk around the city and look at all the art, very beautiful. At night time the city was strangely quiet, almost airy. I don't think I have ever been in a city like that! Dalate was also a nice city but again the culture difference was apparent in the evenings when everything seemed very quiet! I really like the Brother Fortune Ranch, for it has a great setup to facilitate learning to ride and is an amazing place. Arriving at the ranch we were very impressed with the facilities. This was better than we expected. As the Brother Fortune Ranch is quite a way out from the city to find such a lovely setup was surprising. It seemed like we were in the middle of nowhere and to find a ranch that was so modern was quite surreal. I loved the stables, so light and open. The facilities for washing the horses, shoeing and grooming had all been thought out well. I was pleased to see the horses had turned out as not all yards provide this for the horses. The parades here were especially interesting as they were very different to anything that we have in England. We do not really have a parade culture in the UK. The police do parades with horses, our mounted police. This is ceremonial work. Also the Kings troop to parades for Royal occasions. This year we had the Diamond Jubilee, last year the Royal wedding of Prince William. So these horses are brought out for ceremonial duties, for show. It is a big tradition in England. The Queen is a big supporter of everything equine, owning many race horses and polo ponies. She rides regularly and attends many events. Because we already have a large equine culture with horses being used for many disciplines we do not parade with a mixture or disciplines, e.g. Western horses, Lusitanos, Mongolian horses etc. But in China, we really enjoyed them and lovely to see how excited the people were to watch us and the horses. Chinese people are very friendly and welcoming and it was a great way to see the sights of the cities. Saying hello in Chinese and flag waving was a highlight for us! The shows were my favorite bit. The atmosphere when riding in such a fantastic arena with an enthusiastic crowd is unbeatable. When the arena was erected and the people came for the show the atmosphere was amazing. So much life in the city! The Lusitano horses were great to ride and show their versatility from sword play to fire displays and dancing with ballerinas. Holly Barber and I are used to riding different horses and have worked together on many shows so this was easy to choreograph in a short space of time. Our display showed off the beautiful Portuguese dress whilst performing pirouettes and flying changes around the fire. A great chance for the girls to show how it's done! I was very pleased with the performance myself and Holly gave. On the day everything came together, our timing was great which shows in the photos and the horses went very well. It is a great feeling riding to an appreciative audience. It was one of my favorite shows. The Dalate show was difficult for this reason. Due to the weather and starting 2 hours late the audience was walking out during the performance and by the end there was nearly no one left. The finale was disappointing not giving a good feeling. The following day we did a show before the barrel racing and this was full so again a wonderful feeling! We have loved our time in China and really look forward to returning soon for more shows to continue the promotion of horse culture in China.